This full sized art deck is based on traditional tarot decks - with a twist. 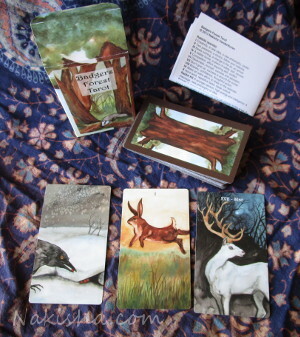 In this tarot, badgers are swords, foxes are cups, rabbits are wands and crows are pentacles. The major arcana includes; deer, bison, elk, ground hogs, chipmunks, opossums, bears and more. The backs are reversible and the cards are numbered and named for easy reference. This is the fourth Tarot deck created by Nakisha, and the first in the "traditional" larger size, with the cards measuring close to 5" high by 2.75" wide. 78 brand new beautiful works of art have been created by Nakisha for this deck, taking three years to complete. If not available on Etsy, these decks can be found at The Game Crafter. 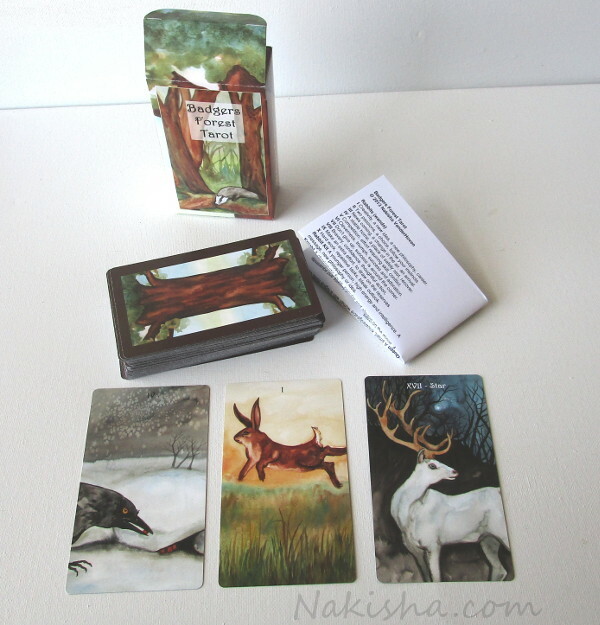 The Badgers Forest Tarot was created with the generous support of Nakisha's fans and supporters through Kickstarter. Without their help, encouragement and selfless generosity this deck would have never have been so successful. A special thank you to these backers for making this deck possible! Sign up on the mailing list to be notified of news about upcoming projects by the artist Nakisha.